A new season of football (the American version) is upon us, in fact as I am posting this a week late the season has already begun. 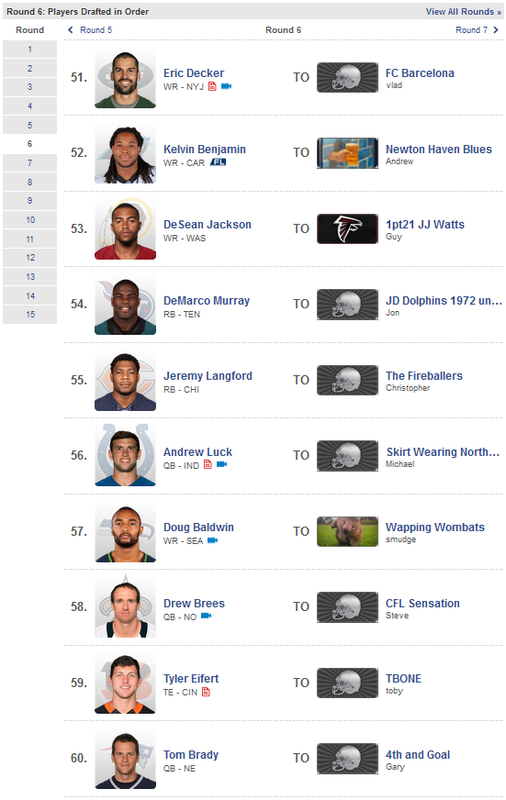 Today I wanted to take a look at draft day for our fantasy league. Draft day is a key first step in any fantasy league as a poor draft can sink your season before you have even begun, although a brilliant draft will not necessarily see you picking up the league trophy at the end of the season. 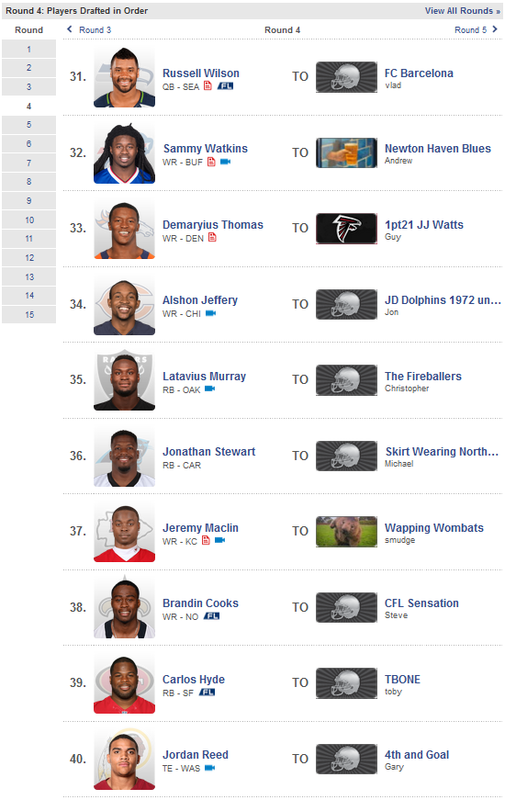 This year I employed a new system to set up my draft board, I would not solely rely on the fantasy "experts" that you find across the internet telling you to pick up this sleeper or miss this guy. Too many times this has resulted in me picking up duds or not investing enough in the team to make it a success, no this year would be different. I spent some time looking at different draft strategies and whether or not they would benefit my team, and then I came across a system that tried to employ a baseline across all different players so that you could pick the guys that, on average, would outperform their positional counterparts. The theory behind this intrigued me and so I decided to employ my own system along these lines. The first thing to do was to find the 20th ranked player at each position, they would provide the baseline, everyone above them should have a "plus" differential, everyone below a "negative". Of course to find this player I had to go out and get some numbers so that there would be something to base this ranking on, using last season's numbers is good but it would eliminate any rookies from making the list and there are always rookies who can contribute to your team. Therefore I went out and collected the predicted figures for all players for the upcoming season from a number of different sources, these were then averaged out to give me a rough score to base the rankings on. 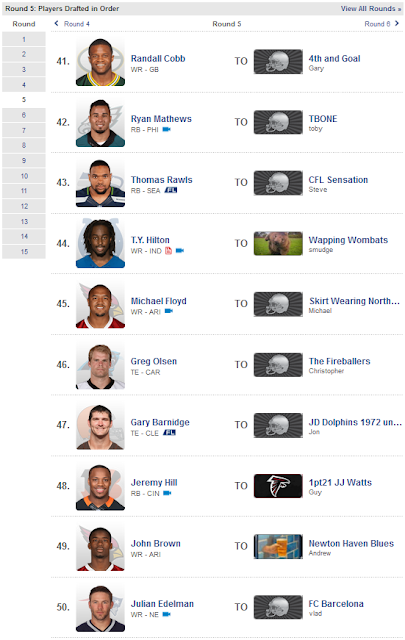 With an honourable mention to the Kansas City Chiefs who were close to making the list. The two key columns to pay attention to are Points, the differential, and Rating, the averaged total scores. To keep my draft board up to date as the draft went on I completed the "Drafted" column and filtered out any players no longer available. I went into the draft expecting to pick up 2 WRs and 2 RBs in the first four rounds. 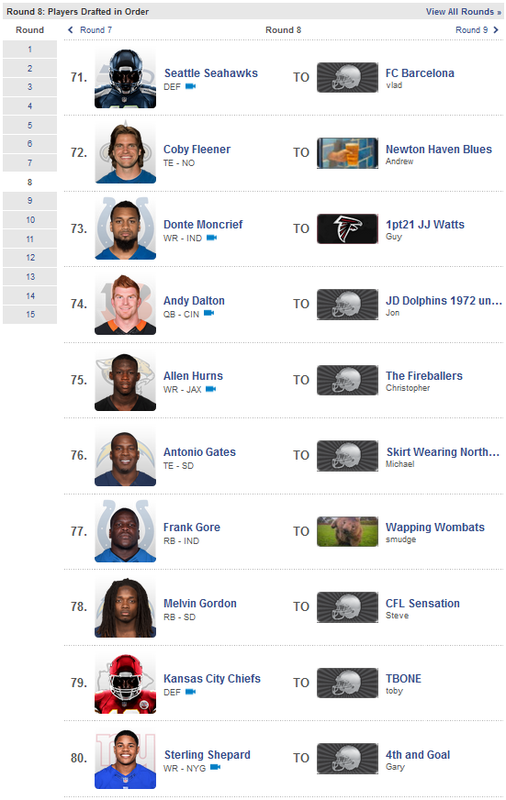 I would add to these positions, along with maybe a QB and a TE by round 10. Kickers and Defensive units would be picked in the last 5 rounds with a few low risk high reward players and another QB. Picking 7th I expected that a number of players at the top of my board would be gone before I got the chance to make my choice, however I was surprised to find Devonta Freeman still available as he had scored out as my number 1 overall choice. Of the 3 RBs selected before him I could see the logic in Petersen and Elliott being picked, but Gurley felt like a bit of a reach to me. David Johnson, who went two picks later, Doug Martin and Le'Veon Bell all were higher on my list than Gurley who I felt was a strong RB but could be prone to a Sophomore Slump with an O-Line that may or may not play up to expectations this year. If any TE was going to go early then it would be Gronk! I must admit that I was surprised to see him go in round 2 as I had expected him to drop to round 3 or 4 while everyone loaded up on RBs and WRs. This time I was picking fourth and decided to balance out my draft board with the 2 RB/2 WR plan in mind. 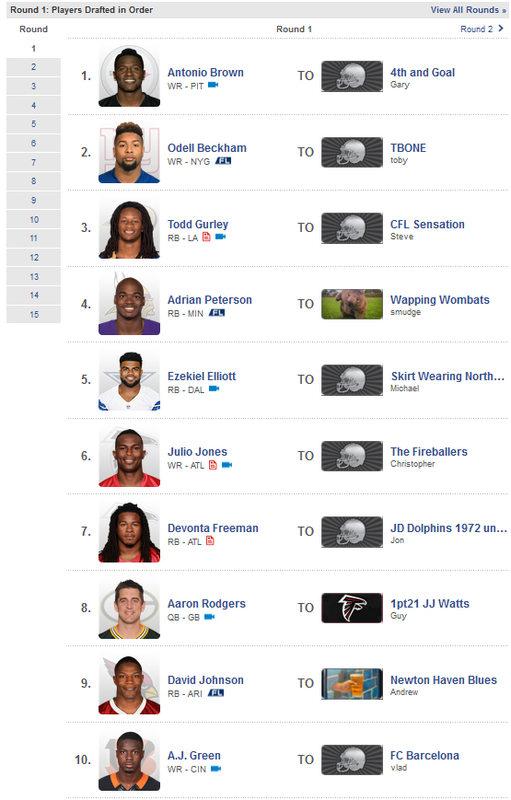 With Antonio Brown and Julio Jones going in round 1 I was slightly concerned that my number 3 WR would also be gone by the time I got to pick. This fear was heightened with AJ Green going at the end of the first, as well as OBJ, as there was a drop off in my WR ratings after these top 5. 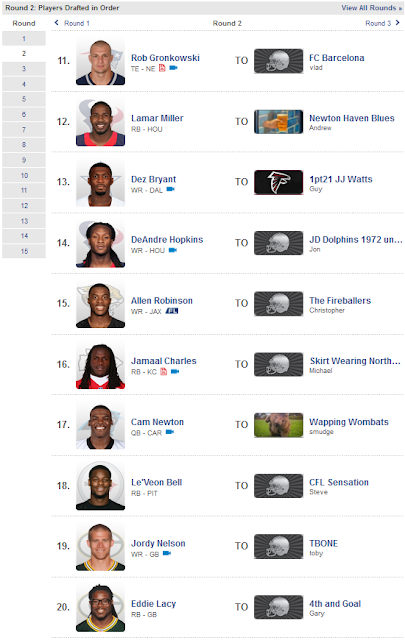 Thankfully DeAndre Hopkins fell to me at 14 and I snapped him up. You can add Cam Newton to the surprise pick list here, especially going in round 2. While he did score out as one of my top 3 QBs for the season, Russell Wilson and Aaron Rodgers did score ahead of him. Add to this that, like Rodgers, you wouldn't expect a QB to go this early in the draft and it could prove to be a bit of a gamble for the Wombats. Slightly less surprising, but still raising an eyebrow or two, was the pick of Lamar Miller at 12. Expected to be one of the top 20 fantasy players according to my board he is definitely worthy of a round 2 pick, but there were a few other RBs that I would have taken ahead of him. This round is usually where things start to get interesting. The best of the best are starting to come off the table and you have to start finding those underrated guys that will pick up points for you. I was back down towards the lower end of the round this time and it was a RB focused round, with a few WRs thrown in. 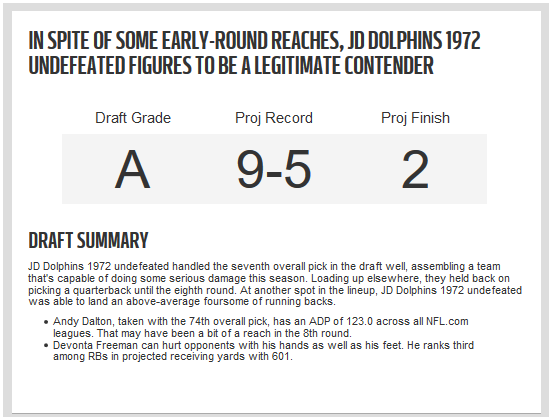 Falling to me at pick 27 was Doug Martin, which I was thrilled with, my number 7 overall player. I was slightly disappointed to see Amari Cooper go at 25 as I had highlighted him as my pick for round 4. 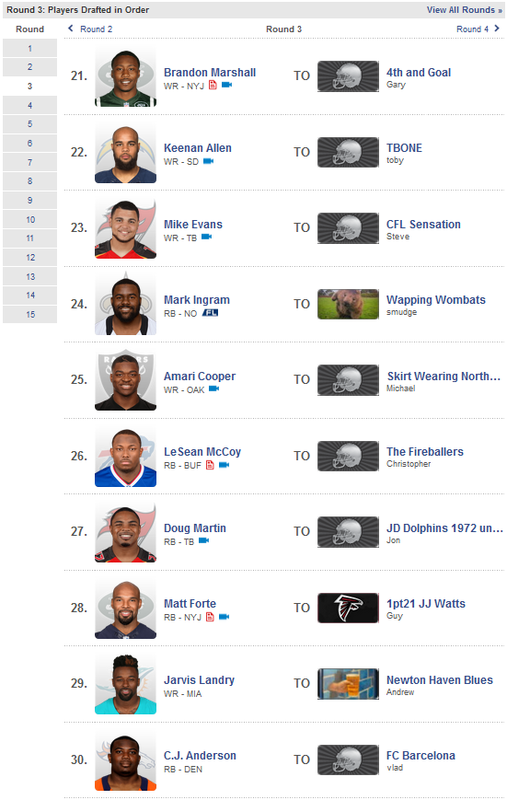 All in all there were no real surprises in this round, everyone there went around roughly where you would expect them to with Matt Forte maybe being the biggest "reach" of the round. Russell Wilson is off the board! My top rated QB for this season is gone but there are still enough decent options available that I'm not too concerned. Instead it is the number of WR that are coming off the board that starts to cause me a problem. 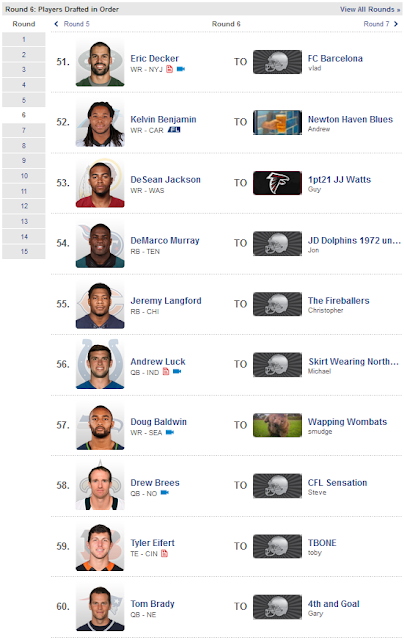 I picked up Alshon Jeffery of the Chicago Bears who should put up decent numbers as the number one option for Jay Cutler but he only just scraped into my top 50 players for the draft. The number of quality WR had dropped dramatically by this point, and I was worried that I may have to reach for a few players that I was hoping to leave for much later rounds. It was good to see Jordan Reed getting some recognition with the 40th pick. Alongside Barnidge of Cleveland and Olsen of Carolina he made up the 2nd echelon of TEs after the standout Gronkowski of New England. With Greg Olsen going the pick before mine I decide to take a gamble and pick up Gary Barnidge before all of my 2nd level TEs were gone. If Randall Cobb had still been available at pick 47 I would have had a decision to make, the return of Jordy Nelson should free him up in the Green Bay Offense, but there were no other WR that I really wanted to reach for at this point in time. Seeing Edelman go at the end of the round stung a bit as he was an option at WR for me. Brown of Arizona was a bit of a surprise in this round as there were still decent WRs on the board. An early pick for me has me excited and then Decker AND Benjamin go off the board before I get a chance to take them, isn't it sickening when that happens? Instead I elect to take comeback player of the year candidate DeMarco Murray. Coming into the season he was slated to be RB1 for Tennessee but his poor performance in Philadelphia last year dropped his stock somewhat. Two big surprises in this round, Eifert and Brady going back to back. Both are likely to make big contributions to their teams once they return, from injury and suspension respectively, but at this stage you are probably looking for contributions right away from your players. It was also surprising to see Luck go early, especially with some other really strong options on the board, but there is a lot of expectation in Indy for a strong comeback year from the Stanford alumni. Another late pick for me and another WR. If the Sam Bradford trade hurt the fantasy stock of any player more than Jordan Matthews I will be surprised. The number 1 WR in Philly, Matthews, looked set to have a big year but with his QB gone, and rookie Wentz taking his place, he dropped to round 7 of our draft. Fitzgerald would have been an option for me here but I was happy to grab Matthews at 67. 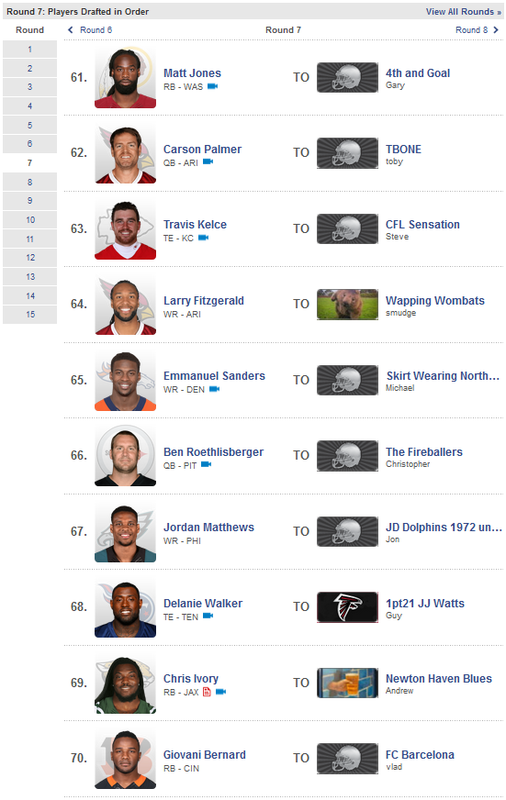 Going at 68 Delanie Walker is a nice pick up at TE. QBs were starting to fly off the board at this point with Palmer and Big Ben going earlier in the round. Another early pick and this time I decide to pick up a QB. Dalton scored out as my 4th rated QB, and with the picks in previous rounds the drop off in QBs was quite substantial with 7th ranked Matt Ryan and 8th ranked Derek Carr 20-25 points behind Dalton. It is possible that Dalton would have dropped a few more rounds, let's face it he isn't exactly the poster boy QB of the league, but it seemed like too much of a risk to let him drop further. The only other options I was considering here were Allen Hurns, who went next, or Michael Crabtree. I was surprised to see two defensive units come off the board here, although Seattle and KC are both strong in this department, but I wouldn't be rushing to pick up my own defence before I was ready. He was a potential target in round 8 so when he fell to me in round 9 it made sense to pick him up. With Cooper drawing a lot of the attention in Oakland Crabtree has slipped under the radar somewhat. A big red zone threat, the WR2 should get his fair share of targets from Derek Carr after the two built up a rapport last season. A second QB was maybe not needed at this time but behind one of my top O-Lines I expect big things of Carr this year. Having two decent options for this position is not a bad thing and it will allow me to evaluate matchups rather than forcing a QB that I don't have 100% faith in. Time to start filling in some of the holes in the roster, I pick up the LA defence. Jeff Fisher had a strong unit in their last year in St Louis and I expect that this will carry over to LA. The self proclaimed number 1 back in Baltimore. A strong start to the season may see him cement this role. Not a bad option for a round 12 pick as he should see a decent number of snaps. Travis Benjamin is a WR with tremendous upside. He was making waves in pre-season so a round 13 pick seems like a fair cost for someone whose reps should increase as the season continues. Cairo Santos fills the need at kicker, he should collect his fair share of points in KC and you can't ask for more than that from this position. Oakland seemed like a good pick in round 15, a second defensive unit is always worthwhile, especially if your first choice seemingly choke during the season. 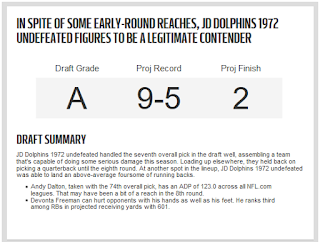 NFL.com provide some amusing recap information after your draft, giving you a rough idea of where you may end up come the end of the season and how likely you are to reach the playoffs and win the championship. I guess we will see how accurate they are as the season progresses.